"Tiny Darling was still living with his brother Jerry Tate down in Pringmar. This was going better than might have been expected. Jerry, who worked for the post office in Morrisville, liked having his brother's company. He liked Tiny's sense of humor and Tiny's conviction that everyone and everything was out to get him and his kind, although when you looked around it was hard to identify anyone of Tiny's kind. He was an advocate of the laboring class who would say things like "It's the working man who gets a ball-peen hammer between the eyes every morning of his life," but he hardly ever did lawful work. He could handle rudimentary plumbing, and when it came to getting a raccoon out of an attic, he was thought to excel. He was a steady drinker who sometimes seemed unusually intent on losing consciousness. One night not long after Louise divorced him, he wandered into Francine Minor's house and fell asleep on her kitchen counter, a loaf of bread for a pillow." And you can pick up the threads with them in Drury's subsequent novels, Hunts In Dreams and Pacifica. 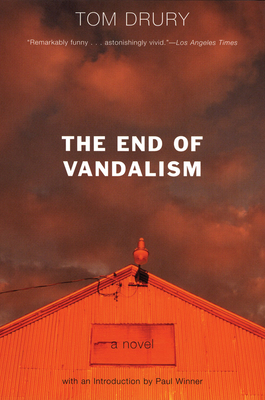 Ten years ago, Tom Drury's groundbreaking debut, The End of Vandalism, was serialized in The New Yorker, was compared to the work of Sherwood Anderson and William Faulkner by USA Today, and was named a Best Book of the Year in multiple publications. Now, appearing simultaneously with his first new novel in six years, Drury's debut is back in print. Welcome to Grouse County -- a fictional Midwest that is at once familiar and amusingly eccentric -- where a thief vacuums the church before stealing the chalice, a lonely woman paints her toenails in a drafty farmhouse, and a sleepless man watches his restless bride scatter their bills beneath the stars. At the heart of The End of Vandalism is an unforgettable love triangle set off by a crime: Sheriff Dan Norman arrests Tiny Darling for vandalizing an anti-vandalism dance and then marries the culprit's ex-wife Louise. So Tiny loses Louise, Louise loses her sense of self, and the three find themselves on an epic journey. At turns hilarious and heart-breaking, The End of Vandalism is a radiant novel about the beauty and ache of modern life.